There are 0 residential real estate listings for sale in Sunny Hills. There are 0 commercial real estate listings for sale in Sunny Hills. There are 0 vacant land real estate listings for sale in Sunny Hills. There are 0 total real estate listings for sale in Sunny Hills. The subdivision of Sunny Hills, located in Washington County, sits on 28 square miles (nearly 18,000 acres), five percent of Washington County's total area. Platted originally in 1972 as a planned development for 60,000 residents, Sunny Hills contains 55 percent of all taxed parcels of land, 24,301 lots, for Washington County and constitutes a great deal of the county's tax millage. The master plan of Sunny Hills delineates 20 "units" with a wide variety of possible uses: single-family residential lots, multi-family lots, commercial areas, sites for community service, churches, parks, and recreational facilities, and general-purpose greenbelt. The commercial lots are located centrally for easy access from all the residential units. The landscape of Sunny Hills combines wooded rolling hills, 4 parks (of 13 included in the master plan), 26 ponds and lakes, and 5 boat landings for the residents of Sunny Hills and the county at large, with plenty of room for greater development. 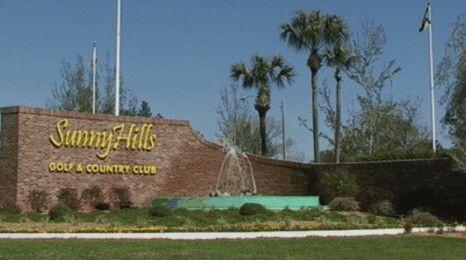 Sunny Hills Golf and Country Club boasts a golf course of 18 holes, and two more will be completed soon. Simply Green Restaurant, located at the golf course and open to the general public, offers an upscale dining experience and can be rented for special events. Beginning in 2007, Sunny Hills Golf and Country Club began construction on 80 new condiminiums and a clubhouse. Water service has been made available to all currently-constructed homes and will be operational for all newly-constructed homes in the subdivision. Some homes have access to the public sewer system and services are being planned for homes and units built after 2007. The current capacity of the public sewer system is 2,800 units. Currently, the population of Sunny Hills is an estimated 1,800 residents with 750 homes. By 2009, the current growth rate puts the population at 4,500 residents and 1,825 homes. It is estimated that the population of Sunny Hills will be greater than that of Chipley by the end of 2008, making Sunny Hills the most populated town in Washington County. There are currently no schools within Sunny Hills itself; students attend classes in Chipley and Vernon. Sunny Hills contains three churches (Presbyterian, Catholic, and Baptist), and many other religious facilities are located in a 20-mile radius of Sunny Hills. Most Sunny Hills residents work in nearby Panama City (25 miles to the south) and Chipley (18 miles to the north). Plans are underway to create and commercial-industrial park in Washington County's southern part. Since its founding 23 years ago, Sunny Hills has hosted its own local "Oktoberfest" on the third Saturday of October and marked its 25th anniversary with a large Fall Festival in 2007. Many active clubs have formed within Sunny Hills, like the Garden Club, Bowling Club, and Crime Watch. The Sunny Hills Civic Improvement Association helps organize and oversee local activities and services.